When you think of Christian music you may think of just boring renditions that are repetitively chosen just because it sounds right. Citizen Way would love to change that thought process about Christian music. Period. 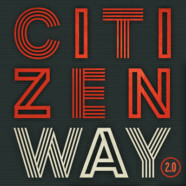 Citizen Way is a band based out of Illinois, and they put contemporary rock into Christian music. On the band’s website, the members want to showcase to people what it really means to love Jesus as their lord and savior in a cool modern way. 2.0. includes eleven tracks to help instigate the message that the band members want to share. They took personal experiences out their own lives into their music because in the end they would like to help people seek Jesus for guidance like they have ultimately. The sound of the album is very uplifting for if someone would like to be in a good mood or in a better mood. The lyrics are great and very easy to understand. It is almost like a sing-a-long if you put the CD into your car’s CD player. Besides uplifting, it is very upbeat but not poppy. I would definitely recommend this album to those under the age of 30 even order to take a listen. If you ever get tired of listening to traditional Christian worship songs, take a listen to 2.0. You will not regret it at all.